I am certainly glad we had an opportunity to ride and camp last weekend because this one so far has been a bust. It rained most of the day yesterday. The house was so chilly I was running the space heater under my desk. It rained most of this morning and finally, the sun came out this afternoon. 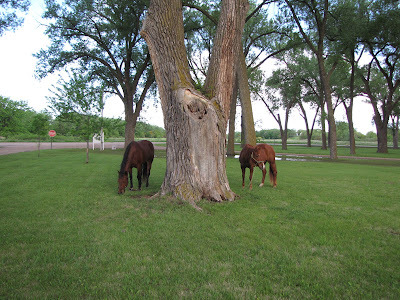 It dried things up enough for us to mow, fix some fence and move the horses to the west pasture. So I guess the day wasn't totally lost, but certainly a good portion of it. I could spend most of a rainy day on the computer; blogging, reading blogs, writing stories, and editing pictures. Okay, that is pretty much what I did after work yesterday. So I really needed to be productive today. I won't bore you with the humdrums of housework but I do question my sanity at having pets in the house. Oh, I know – I would go insane without the dogs, but between their hair and dust, I can only be grateful none of us have allergies. Heck, the dog hair in my nose probably keeps the dust from getting in! Bodette, our St. Bernard, is the worse! I told John that Bo is not allowed in the bedroom anymore. He just laughed. Yeah, try to move a lazy St. Bernard after he finds his spot for the night. And to further this day of domestic bliss, I made the Pioneer Woman chicken fried steak tonight for supper. Not exactly diet food, but the guys seemed pleased. There is a forty percent chance of rain tomorrow; 60% chance it won't. I'm going to take a gamble that it will miss us and get out and put some miles on my horse. Wow. Such a huge contrast between your weather and mine. Here we've got temps of over 90F and winds between 50-60 mph, no rain for more than 7 months. Did I mention how dry it is? There is absolutely no mowing going on anywhere around here. There's no grass! PW's recipes are da bomb! My family loves them. But if we ate them every day, we'd be as heavy as a bomb! lol! Here's hoping for some good weather so you can get outside and enjoy some riding. Ha Tammy! Funny you should mention blogging, editing..while having the space heater on at your desk-THAT, my dear, is what I'm about right now! Today was supposed to be our best day..and it's cold, raining crapola out. Glad I rode yesterday! That recipe did sound good! I should be outside right now working with my filly, but the weather man said there was going to be sun breaks, I am still waiting. It's a little chilly out there and the first moment that sun breaks through, I'll be heading out the door! But I should be thankful because it actually isn't raining at this moment!! Just thinking about Pioneer Woman's chicken fried steak would make me fat. Oh that woman knows how to cook but does she eat what she cooks? And if she does, how does she stay thin? That's what I want to know. I dont' have a space heater at my computer but now that you mention it, I think I could use one.